Hippity Hoppity into the Easter holiday. Meet Faustee, he is dressed in brown overalls and blue shirt. He is pushing a wheelbarrow full of carrots to share. He is made of polyresin. 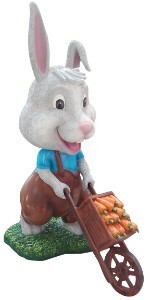 Children of all ages will love these bunnies, they are ear-resistible.